M.B. is a retired business executive from Kansas City, MO. 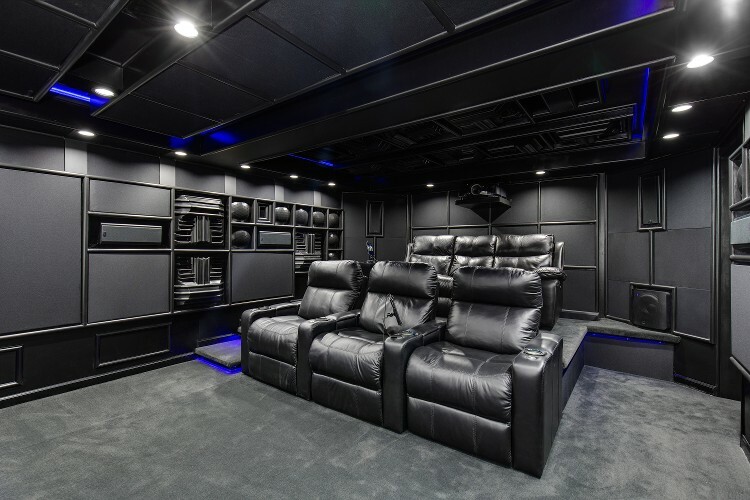 The client desired a high performance home theater to be created as part of a basement finishing project. The desired aesthetic was “black, but not boring”. You can read more about the project on the Small Black Basement Theater thread on AVS Forum. Acoustic Frontiers were involved as a technical consultant over a four year period from concept through to calibration. Home theater layout. 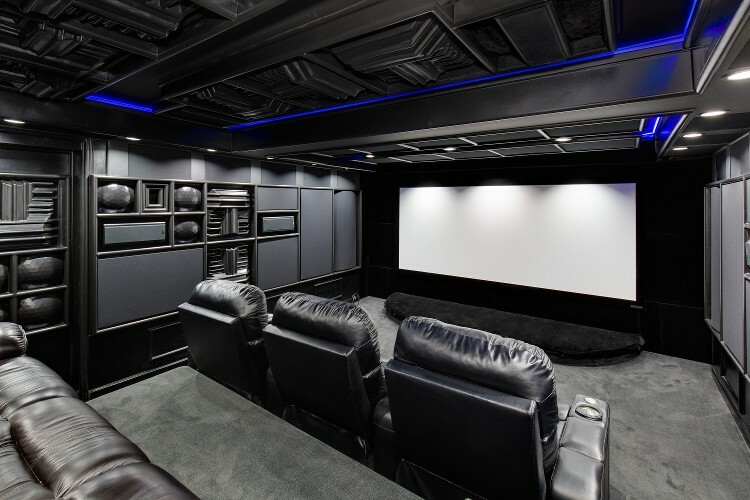 The room was originally designed as a 7.1.4 in the pre-Dolby Atmos days, but was subsequently modified to a 9.1.2 before implementation. Sub number / placement optimization. Audio / video equipment engineering. 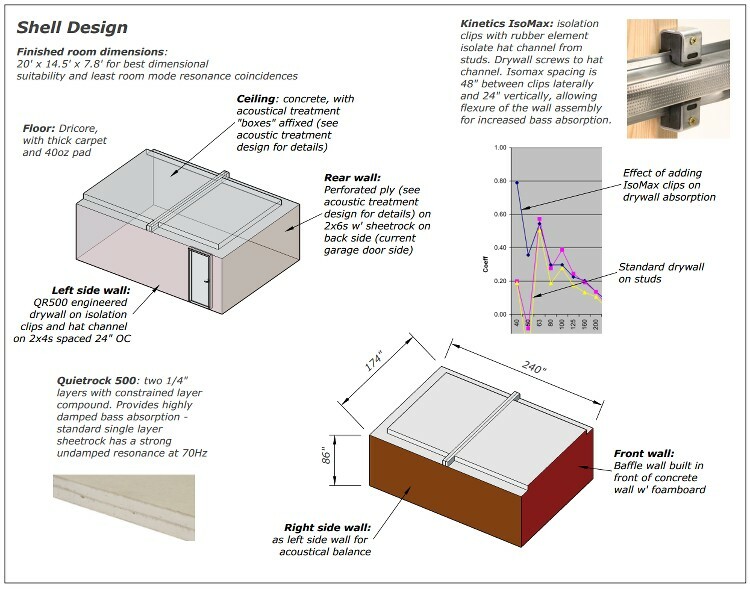 Acoustic treatment design. The room included many hidden elements to control room modes insides the concrete basement shell, including a baffle wall, floating side walls and low-Q (wide bandwidth) Helmholtz bass traps. Onsite Dirac Live audio calibration, including separate music and movie profiles. The client and his contractor were responsible for the aesthetic design and construction details, with the exception of the screen baffle wall, which we provided detailed plans for. Acoustic treatment concept for the basement home theater. Acoustic Frontiers provided the bulk of the equipment, including a timbre matched 9.1.2 Procella P8 / P5V speaker set, four SVS SB-2000 subwoofers, a Datasat LS10 pre-pro, Parasound Halo power amplifiers, Seymour AV projection screen and a Sony VPL-VW675ES 4K projector. The projector was calibrated at our facility for SDR and HDR before shipping to the client for installation. Equipment installation and programming of a Control4 system was handled by a local AV installer. Electrical power and surge protection for the room was supplied by a 240V in, 120V out Torus Power RM20BAL. The power requirements were calculated by Acoustic Frontiers per the standards defined in CEDIA CEB-24. 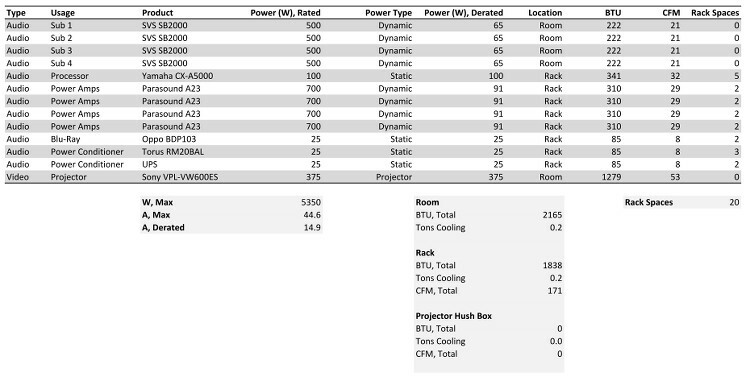 Electrical power and HVAC requirements for the home theater. We think this basement home theater turned out really well. Black is not boring! The exposed Auralex diffusers and wood trim add an architectural element that gives the space real visual impact. View towards front of the basement home theater. My construction skills are non existent. Fortunately I met Dan, a local contractor who agreed to take on the project. His stipulation was that due to the highly custom nature and many unknowns, he would only work on it between regular and more lucrative construction jobs. The acoustic design and equipment specifications were done by Nyal Mellor from Acoustic Frontiers. I am embarrassed to say but the original design was done over four years ago with an Atmos revision in 2015 resulting in a 9.1.2 theater. Nyal has been fantastic to work with. He listens and hears your needs and wants, but isn’t shy about setting you straight either. I think he is also very flexible in working with a variety of budgets. Nyal recently visited to calibrate the completed theater.” M.B., Kansas City, MO.